A lot of local car repair shops boast about their customer service – we prove it. Dave’s Auto Care was awarded the 2012 Angie’s List “Super Service” Award and enjoy an A+ rating from the BBB. What we’re most proud of, however, is hearing from satisfied customers about their client experiences. Dave’s Auto Care was established in 1981 with the goal of becoming Lake County’s premier automotive repair facility. 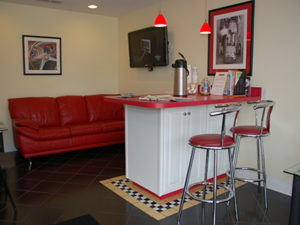 Beginning as a Shell Auto Care franchise at Vine Street and Route 2 and expanding into a 10,000 square foot state of the art repair center three blocks east, we have become the leading choice in our area for people who demand exceptional quality, service and value for the maintenance and repair of their automobiles. Our Certified Master Technicians will put you at ease knowing that their experience and caring attitudes have your best interests in mind. We want to build relationships with our customers and their vehicles by addressing their needs and answering questions they may have. We provide advice and help guide you through the complex decisions required to properly maintain today’s sophisticated cars. We use the latest electronic equipment to aid in accurate computer diagnostics. The latest auto manufacturer’s service bulletins and recall notices are received through advanced internet connections to always keep us up to date. Our staff receives continuing education through the various vehicle manufacturers’ training programs. You’ll enjoy relaxing in our comfortable lounge which features satellite TV, coffee service, wi-fi and more. Take a moment to come by and see how Dave’s Auto Care makes the car repair process simple and convenient .